> SAS > The Current State of Business Analytics: Where Do We Go From Here? 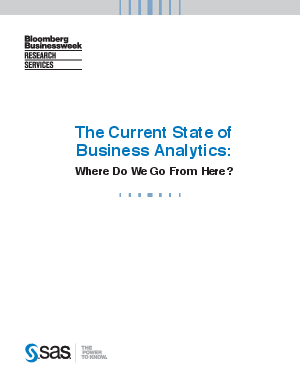 This white paper reveals the results of a Bloomberg Businessweek Research Services survey of 930 respondents from across the globe on the current state of business analytics within organizations. Inside, you'll discover intriguing and unexpected findings on how and why the use of analytics has continued to grow over the last two years. Why the benefits of business analytics are clear, yet the learning curve for business analytic maturity can be steep. The commonalities shared by data-driven organizations for business analytics success. How organizations currently balance experience vs. analytics for decision making.